It dishonours the name of the Lord Jesus. If you are a Christian, you represent the Lord Jesus. When you yield to sin, you bring dishonour to His name. It robs you of your joy and power. As long as you are yielding to sin, God will not use you. It destroys your Christian testimony. Other people judge your Christian witness, not so much by what you say, but by the way you live day by day. Right now, by your life, you are saying one of two things to other people. 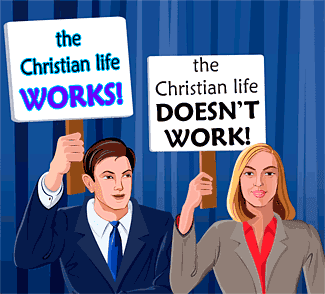 You are saying, "The Christian life works!" or you are saying, "The Christian life doesn't work." The way you live as a Christian affects not only your life, but the lives of other people as well. Do you see why it is so important for you to be a victorious Christian? What, then, is the victorious life? The victorious life is a life of peace and joy in the Lord. It is a life of constant fellowship with the Lord. It is a life of victory over sins—even the so called "little sins," such as temper, fault-finding, irritability, complaining, lack of love, envy, jealousy, unkind words, wrong thoughts, worry, anxiety. The victorious life is a life that glorifies the Lord Jesus—the only kind of life that glorifies Him. Who can have this kind of life? Any believer! It is for you! The victorious life is not for just a few, special Christians. 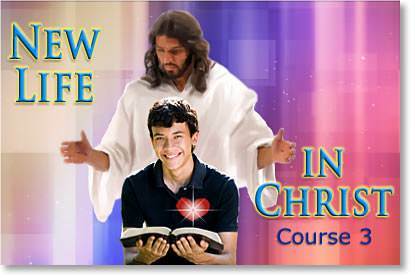 It is presented in the New Testament as the normal Christian life. God has made provision for every Christian to live this kind of life. Let's see what the Bible says about it. The next thing we need to see about the life of victory is that it is by God's grace. What is grace? Grace is something God does for us. 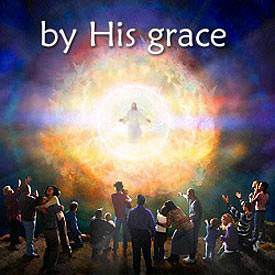 Grace has often been defined as "God's unmerited favour" but grace is much more than this. Grace is God's mighty, omnipotent power working for us, doing things for us that we could never do for ourselves. From beginning to end, our salvation is all of God's grace. But don't we have a part in salvation? Yes, we do. What is our part? Our part is to receive what God's grace provides for us. 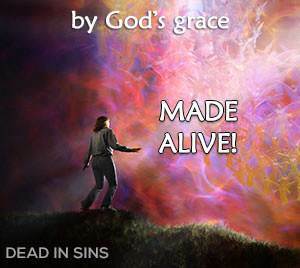 Now, let's consider our salvation and see the part God's grace has in it. What about this? Will we be caught up to meet the Lord by our own power? No, not at all. It will be by God's mighty power. It will be by His grace. What about now? Are we just to struggle along in our own strength, doing the best we can, but failing miserably? No! God has made it possible for us to be victorious now. What is God's provision for us now? His provision is His grace—His mighty power working in us. No matter what our situation may be, God says to us, "My grace is sufficient for you." God's grace for us now is simply Christ living in us. 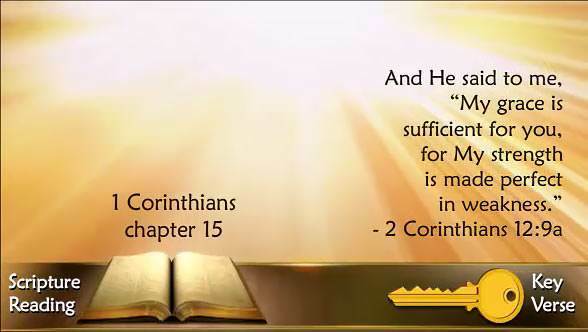 When God says, "My grace is sufficient for you" He is saying, "My Christ is sufficient for you. Trust Him. He can give you victory in every situation." Jesus Christ makes two offers to every person. He offers them eternal life, and He offers them victory over sin. He makes both of these offers on exactly the same basis—that we let Him do it all. If you were working at a job, and the Lord Jesus came to you and said, "I will give you rest," what would you expect Him to do? You would expect Him to take over your job and do it while you rested. This is exactly what He wants to do for you. Perhaps you have been trying to live the victorious life, but failing. The Lord Jesus says to you, "Let Me take over. I will live the victorious life in and through you." How Do We Enter the Life of Victory? 1. Commit yourself to Christ. 2. Take Christ as your Victory. Let us consider these two conditions. The Lord Jesus was able to keep Paul and to give him victory, but the Apostle Paul had done something that enabled the Lord to do this. What was it? Paul had committed himself completely to the Lord Jesus. If you want the Lord to keep you and to give you victory, you must commit yourself to Him. Is there anything in your life this moment that you have been holding back from the Lord? If so, will you give it to Him right now? Turn over the past to Him with all its sins and failures. Commit the future to Him with all its unknowns. Commit your loved ones to Him—that young man or young woman you love. Tell God that if they are not His plan for you, you are willing for them to pass out of your life. Tell Him, right now, that you turn over to Him all that you are and all that you have, for time and for eternity. When you do this, you will have taken the first step toward victory. Will you do it right now? Next, you must take Christ as your Victory. Taking Christ as your Victory is very much like taking Him as your Saviour. What did you do when you took Christ as your Saviour? You came to Him as a helpless sinner, and you trusted Him to save you. What do you do when you take Christ as your Victory? You come to Him as a helpless, defeated Christian, and you trust Him to give you victory. Will you take Him as your Victory right now? 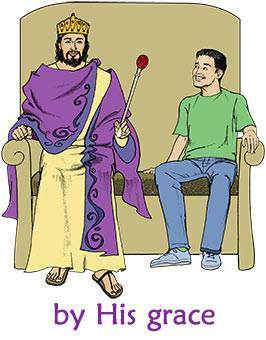 Just say to Him, "Lord Jesus, I have tried and tried to live the Christian life, but I have failed. Right now, I take You as my Victory. I am trusting You to give me victory." When you took Christ as your Saviour, how did you know that God had saved you? By His Word! You took God at His Word, and you thanked Him for saving you. When you take Christ as your Victory, how do you know that God has given you victory? By His Word! What does God say? He says, "My grace—My Christ—is sufficient for you." Will you take God at His Word and thank Him, on the basis of His Word, that His grace is sufficient for you? Thank Him that Christ is actually living in your heart, and that at this very moment, He is meeting all your needs. When you surrender to Christ and take Him as your Victory, you have entered the life of victory. You can say, "I know my Lord Jesus is meeting all my needs, right now, because His grace is sufficient for me." How Do You Continue in Victory? 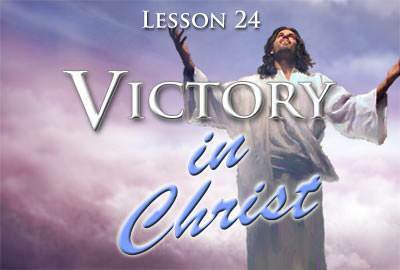 You enter into victory by yielding to Christ and trusting Him as your Victory. You continue in victory by continuing to yield to Christ and continuing to trust Him as your Victory. Victory is not a once-for-all matter. It is taking Christ as your Victory moment-by-moment. Your attitude becomes one of depending on Him moment-by-moment. Remember, victory is by God's grace. It is not gritting your teeth and struggling to keep yourself under control. It is a miracle of God's grace. It is not TRYING but TRUSTING. Trying is what we do; trusting is letting the Lord do it for us. Will You Ever Fail Again? Yes, there will be failures as you learn to walk in victory. As we have already said, the victorious life is not a life without sin. What will happen when you fail? Will you be discouraged and say, "It just doesn't work. I cannot be a victorious Christian. It is all right for others but not for me"? This is just what the devil wants you to say. Don't do it! Did you ever see a baby learning to walk? What happens? He takes a few steps, and then he falls down. Then what? Does he lie on the floor and say, "It's no use. I just can't walk. I'll never learn to walk."? No, he doesn't do this. What does he do? He has a good cry. Then he gets up and starts to walk again. He has other tumbles, but he keeps at it until he learns to walk. This is the way it is in the Christian life. While you are learning to walk in victory, you will have many falls. What should you do when you fall? Get up! Confess your sin to the Lord. Tell Him that you did not mean to fall. Tell Him that you want to live the life of victory. Then start again. Walk once more, trusting Christ as your Victory. As time goes on, you will find that you are not falling so often. When you fail, you should never remain in defeat. You can be instantly restored to your place of victory. How? By confessing your sin to God and, once again, claiming Christ as your Victory. Remember, Christ has not failed. He is still the victorious One, and He lives in you. Don't read this lesson one time, fill out the answer sheet, and think that you know this truth. Study this lesson over and over until its truths become real in your life. Anything that Jesus Christ has ever done for any of His disciples, He will do for YOU! 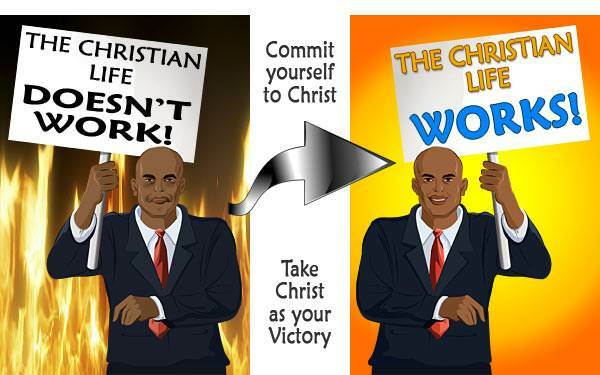 You can be a victorious Christian! Don't say that this life is for others, but not for you. God means for you to live victoriously. You must believe that the life of victory is meant for you, right now, in your circumstances. * Choose the life of victory. The life of a defeated Christian is hard. 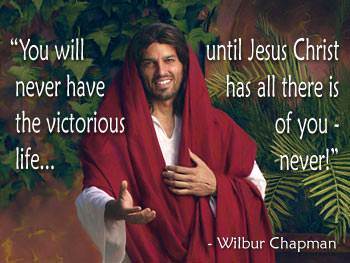 The only happy life, the only life that honours the Lord Jesus, is the victorious life. * Take the steps of victory. Commit yourself to Christ. Take Him as your Victory. * Trust Christ moment-by-moment. In every situation, depend on Him. Say, "I know my Lord Jesus is meeting all my needs, right now, because His grace is sufficient for me."